I have been let my writing lapse for a week and I apologize for that. I have been sick and was not feeling the foodie that I normally am. I am back with a few pic-ey’s that I have collected for when I was in more of a writing mood. 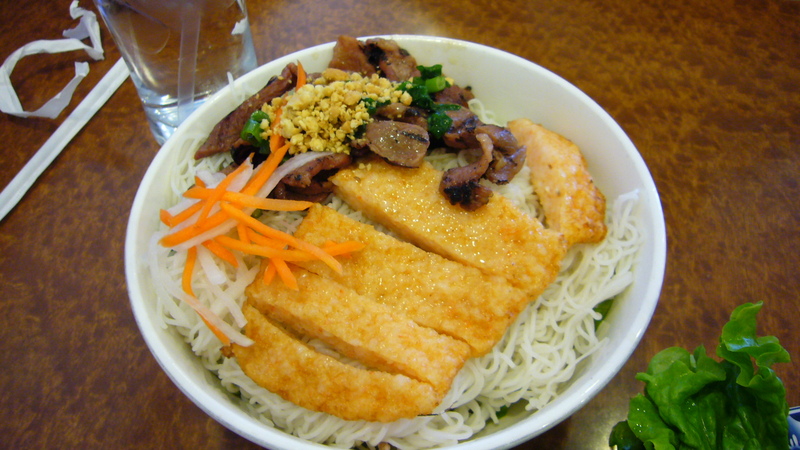 I have not been able to kick this need to eat Vietnamese food! Not that I should have to, but I like to go out different places if possible. Spread my earnings around. Well if I am going to have a hankering for it might as well be Vietnamese food with all it’s crisp fresh vegetables and vermacelli noodles! 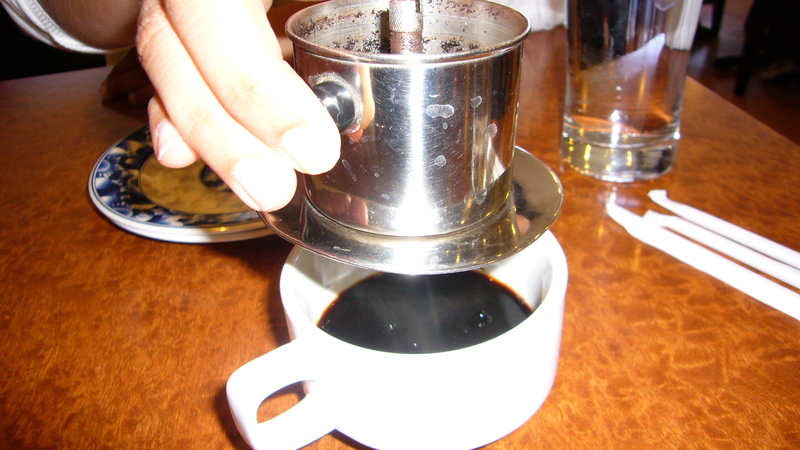 Below is my Vietnamese Milk coffee which I will normally order first just to get the thing good and brewed by the time I finish my food. What you can’t see is below the delicious thick coffee is another layer made up of sweetened condensed milk! HEAVEN…..after I poor it over ice and let that settle a little. 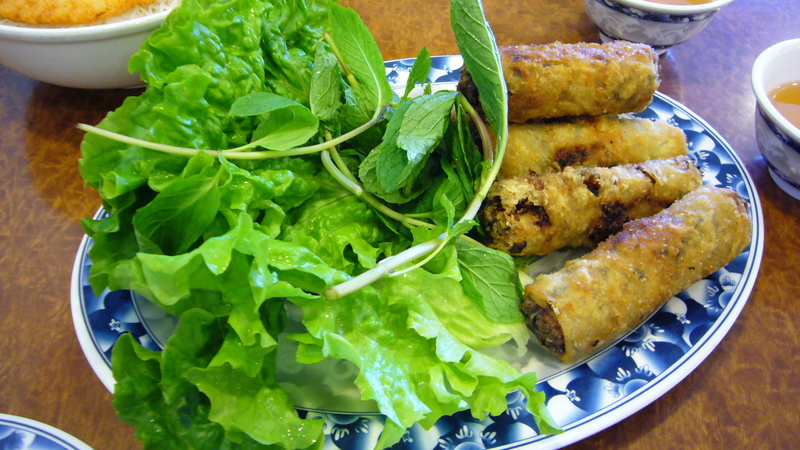 Egg Rolls Fried to perfection. Bun with Fried Fishcake and Grilled pork. This is the first time I tried Bun at a Pho place before! My dish was a meat festival! Below all the vermacelli noodles is a bed of bean sprouts and leafy aromatic herbs. It’s nice summer food. Bun with pork sausage and char grilled pork. This was not the same location I originally went to in the San Fernando Valley. 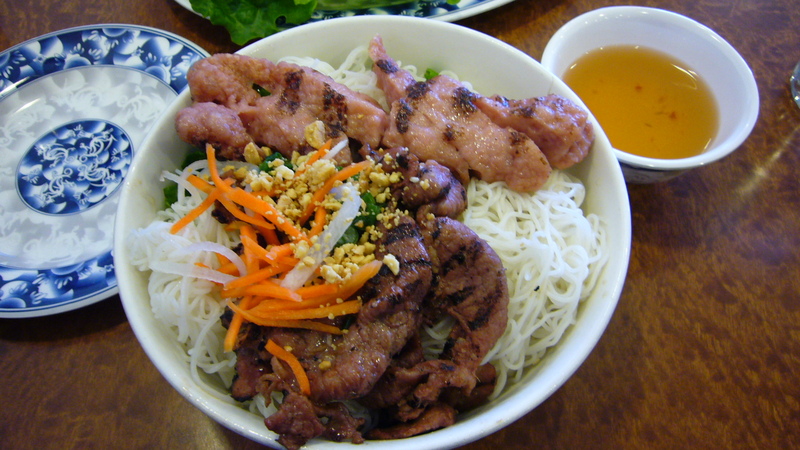 They are in the same chain of restaurants and I think they do a great job with their Vietnamese cuisine at both locations. I think I prefer this location because it is closer to my house. I like the San Fernando one because they have an Asian Market next door. 9:00 am – 9:45 pm Mon. – Sun. Meat FEST! The veggies look too good…Get Better, Tessa! ZICAM!